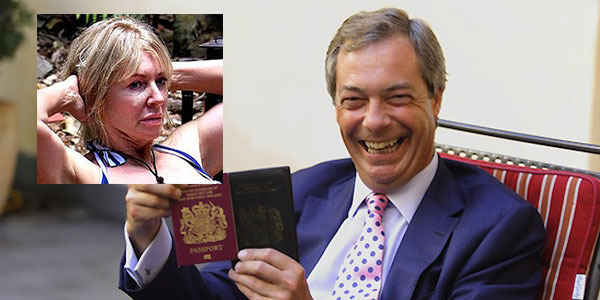 TheBlueGuerilla: Farage Accepts Dorries' Tory/UKIP Joint Ticket. Statement from UKIP Leader Nigel Farage on Nadine's joint ticket banter. "If Nadine Dorries’ association come to me and say they’ve passed a resolution, and they want her to run as a joint candidate in 2015, I will go and ask my local association how they feel but my inclination would be, why not? What on earth is wrong with doing this? To be fair, that's all fiar and dandy until the Lib Dems start sneaking up on us. If Dean Hyatt stands in Bedfordshire we could be buggered. I can just imagine him in a taxi with Ming Campbell and Mike Hancock the only other Lib Dem MPs on 7th May 2015.